The Water Machine uses the process of distillation for purifying water. All of the water on earth is purified by the Hydrologic Cycle, the natural form of distillation. We experience this process daily. This time honored process produces a guaranteed quality of water unmatched by any other treatment method. As water evaporates, it leaves behind all contaminants. Pure water vapor condenses, providing a fresh supply of pure water. Water Ware Inc. offers this natural process for your use! This proprietary system is not available anywhere else. 6-Stage process: Filtration, Distillation, Aeration, Carbon, Ultraviolet, Pressurization. Fully automated, computer monitored, on demand operation. No manual procedures. Opens up floor space lost to water coolers and stored bottles. Eliminates Clutter. Eliminates the wasted time and hazards of moving and lifting heavy water bottles. Pure water delivered at room temperature and "Instant Hot" for soups & beverages. High-pressure pure water supply for a refrigerator's chilled water and ice production. Pure water production rate five gallons per day. 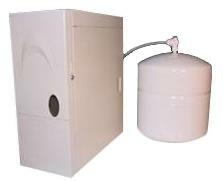 Pure water stored in sealed, pressurized tank that can be located where convenient. High capacity storage tanks available.